Join us March 29th at 7pm for a look into the underwater world of Jacksonville Florida. TISIRI will introduce offshore scuba diving and fishing destinations of North East Florida, the wild animals living there, and how some of these reefs systems came to be. Furthermore we will discuss TISIRI's upcoming efforts and describe how interested participants can get involved. Click on the image below for a map to the venue location. More details below the image. The event is FREE however as a a 501(c)(3) non-profit organization, donations are always accepted to support our mission. We will have raffles, door prizes, and food. Participants are encouraged to bring some cash to take avantage of the raffle opportunities. 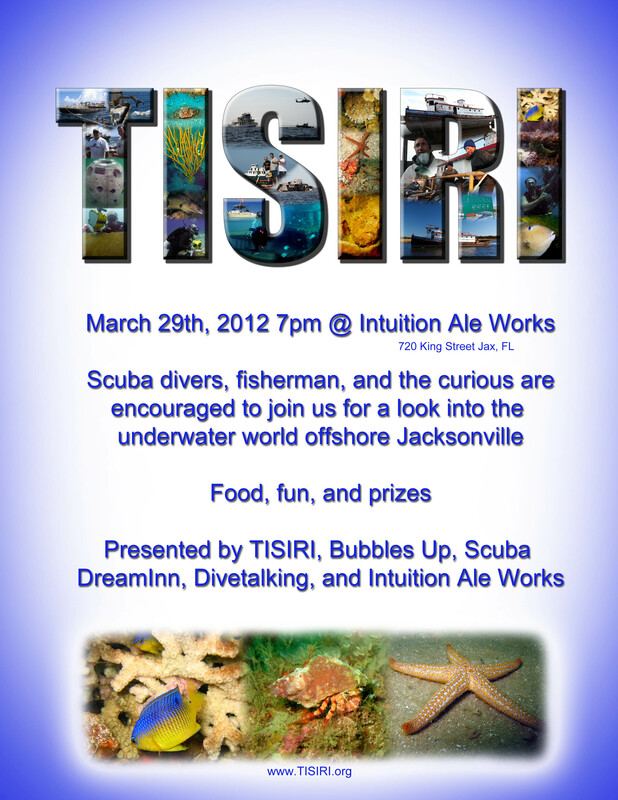 This event is sponsored by TISIRI, Bubbles Up, Scuba DreamInn, Divetalking, and Intuition Ale Works. Please drop us a comment below if you will be attending. Thanks and we look forward to seeing everyone there. Can’t wait! Count me in. Heck ya I will be there! We have some great sponsors for this event. Take part in our raffles for prizes from Bubba Burger Bar and Grill, Buffalo’s Southwest, Chick-Fil-A, Jacks or Better Casino Cruise, Salt Life Food Shack and more! I’ll be there as well, excited to see what is going to be said! Count me in and I am bringing some friends. Can’t wait to meet TISIRI! Sounds interesting. I will be there.